Working out what to pack for kids and toddlers can cause headaches – especially if its your first trip. Should you take a stroller, do you kids need headphones? What will they sleep on? Is there something you need to take that you aren’t thinking about at all? Hopefully this article will answer all these questions! Toddler and kids’ travel gear basically revolve around 4 different areas – eating, sleeping, getting around and playing. You can also read our guide to the best baby gear. For younger toddlers, you might want a travel high chair. 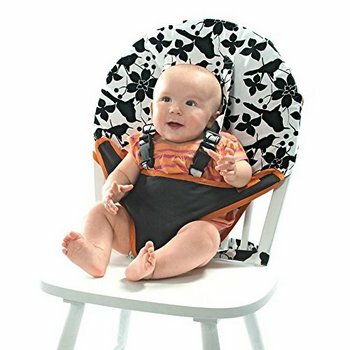 These help convert normal seats into high chairs and are invaluable when traveling in countries that don’t have high chairs readily available or for when you are staying in apartments. If your toddlers are anything like mine then you might also want to consider a wipeable bib. It helps them clean and is easy to wipe down for the next use. 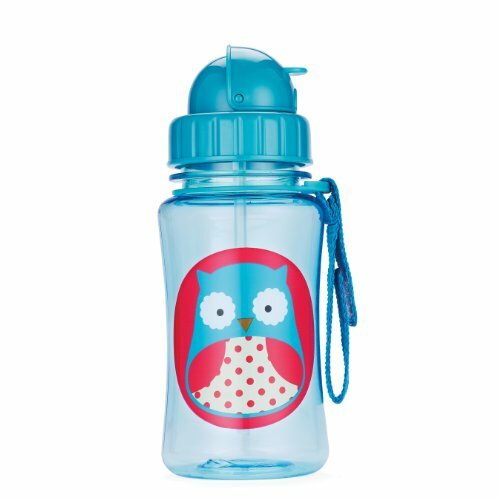 If your toddler is still drinking from a bottle, you might want to read our guides to the best bottle sterilizers and the best bottle warmers. Something we find absolutely invaluable for our kids are water bottles with a strap. This way our kids can carry around their own water bottles saving us from needing to take a backpack out and about with us. They have easy access to water and it saves us money in restaurants. There’s nothing not to love about this style of water bottle and it’s one of our most essential travel items. S has one just like this. If your toddler or kid needs to still be in a contained crib then I recommend a travel crib. See this article for our recommendation of travel cribs. 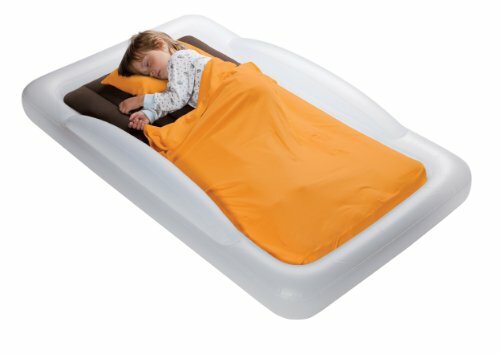 For older toddlers and kids, unless you are sure you are always going to stay somewhere with enough beds (and you are happy to pay for them) then I recommend taking a toddler travel bed or a self-inflatable mattress. We always travel with one of these as it saves us a lot of money in Asia. This is one like what we have. Read our full guide to toddler travel beds here. Another of the kids travel accessories you will want to consider is bedding. We take a cheap sleeping bag liner from eBay. This works well as we tend to travel in hot climates. If you spend time in colder climates, I would consider a kids’ sleeping bag. We also have found our Sneck kids’ travel pillow to be handy for bedtime. 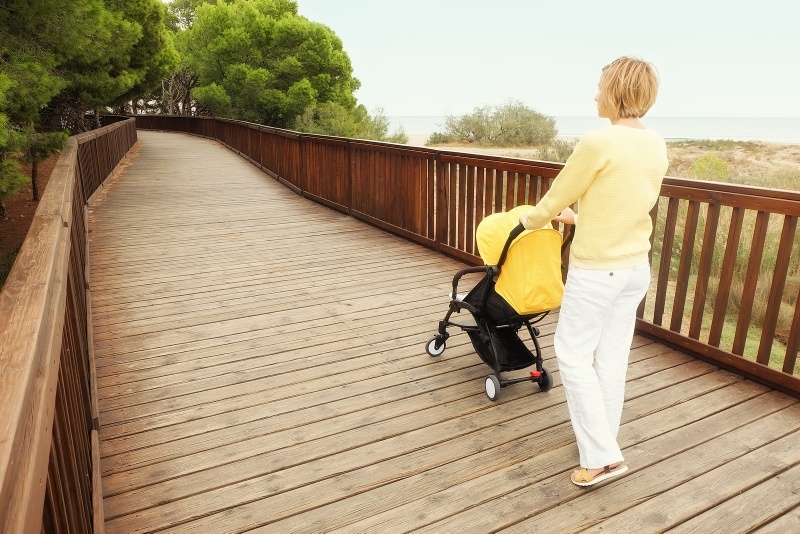 For toddlers and preschoolers, you are definitely going to want to consider a stroller. We have a love/hate relationship with taking a stroller traveling – we love using it but get frustrated by the extra item of luggage. We definitely recommend taking a stroller though, particularly a lightweight, umbrella stroller or a purpose built travel stroller. These tend to be the easiest to carry around. On our recent trip to Europe, we just bought whatever stroller we could find which was a mistake. It was bulky and annoying. I definitely recommend researching and buying a stroller beforehand. You can read my full guide to travel strollers here. I am particularly a fan of the UPPAbaby G-Lite Stroller if you are happy with one that doesn’t recline. We also love our Mountain Buggy Nano which has a good recline and a crazy compact fold – small enough that we can carry it over our shoulder, freeing up our hands. It also meets the size requirements for carry on luggage for most airlines. We are also big fans of Maclaren strollers. If you would rather something a bit bigger, you can find a guide here. 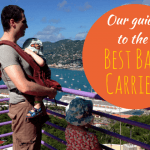 It can be surprising how easy carriers make carrying around even bigger toddlers and this can be a handy travel accessory to take on a trip. In fact. I would prefer a carrier over a stroller a lot of the time as long as it is comfortable. We are particularly fans of the Ergobaby Original Baby Carrier and the Ergobaby Adapt. 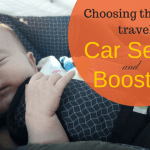 One of the most important kids travel items and car seats and booster seats. If you are hiring a car on arrival, you can often hire a car seat. However, this can be crazy costly and they are not necessarily in good condition. For these reasons, it can be good to take your own. You can read our full guide here. For kids 4 and over who just require a booster seat, we particularly recommend the BubbleBum Inflatable Booster Seat for travel and the Boostapak. The Bubblebum is ideal if you want something ultra small to pack and the Boostapak is perfect if your kid would also like a cool backpack! You can also read our full Bubblebum review and our full Boostapak review. Australian readers please note that these options are not suitable for Australia – they are great to take overseas with you though. Kids can also make great use of travel pillows. Ours have both enjoyed having Sneck Neck Pillows to use in cars, on planes, in bed, etc. You can read our full guide to travel pillows here. If you have read this blog much then you know I have one overwhelming favourite choice when it comes to travel and kids’ travel toys – the iPad. 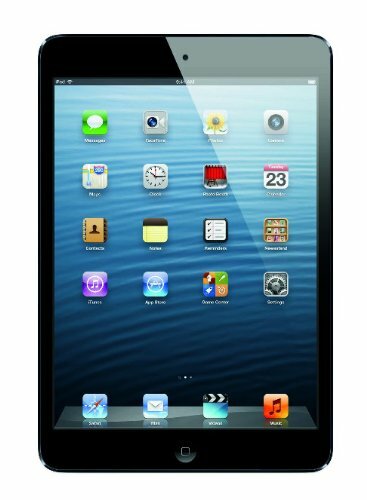 I particularly recommend an iPad mini. We have a bigger one as well which seems to big next to the mini. The kids handle the mini better as well. As for other fun travel gear for kids, we find cheap, small items are the best that we can rotate – as in we can switch it for other toys as we travel, as well as a favourite toy for bedtime. Colouring in items, learning books, pencils, etc, all work well as well. We have also had fun using a book like this on flights this year. Making the animals pass the time well for all of us and then the kids have something new to play with on the flight. The other three items you might want to consider are kids’ headphones, a disposable potty and a Trunki. 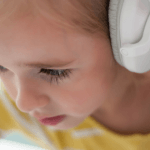 Kids’ headphones can be handy for listening to their iPads or using on board flights when there is an in flight entertainment system. You can read our full guide to them here. If you are currently toilet training you might be interested in a ComfyDo Disposable and Foldable Travel Potty Training Seat. Our kids’ Trunkis are one of our most essential kid travel items. They are perfect for us! They fit all the kids clothes and toys and they are easy and fun for them to pull around. They make a great seat whenever we have to wait (which seems to be a lot in airports) and when they are tired, we pull them along on them. They also use them to play when we are at our destination – they ride around on them! You can read our full Trunki review here or check them out on Amazon. 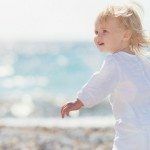 Hopefully, you have found this article about the best travel gear for toddlers and kids helpful. I’d love to know in the comments if you have any kids and toddler travel essentials that you would recommend. 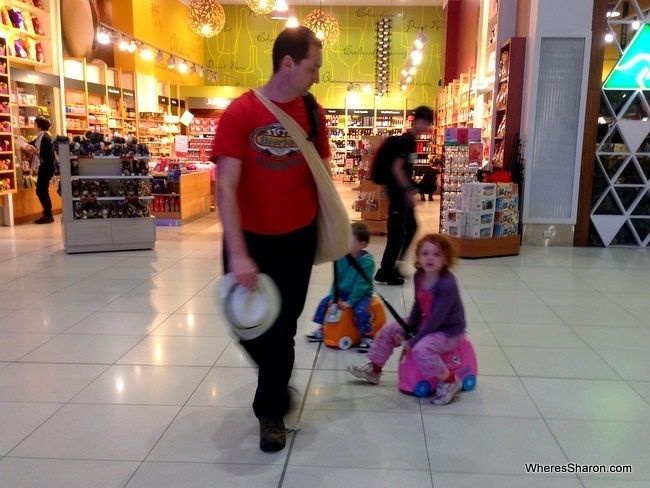 What do you think are the best kids travel accessories? Oh my word- the Trunki!!! Best airport accessory ever!!!! The Trunki´s are great!! We used to have those for our kids. Thanks a tonne Sharon for writing such a description travel blogs. They are the best I have ever came across. Just a quick question for you. we are travelling to Malaysia (KL and Penang) with our 2 year old. and he still drinks milk many times during the day and night. Do you recommend taking formula milk powder with us? or is it easy to get it from KL? Hi! It’s easy to get formula in Malaysia. However, if you want a certain brand, it may be better to take your own as you may not find exactly the same. Enjoy Malaysia! Very nice advice re travel gear for kids. I was interested to see that some is not applicable to Australia. Some of the best travel gear in the world is illegal in Australia. My preferred universal power adapter is also illegal to sell in Australia. Interesting! After spending awhile overseas last year, I must admit that I am getting increasingly frustrated by many of the nanny state rules in my home country. 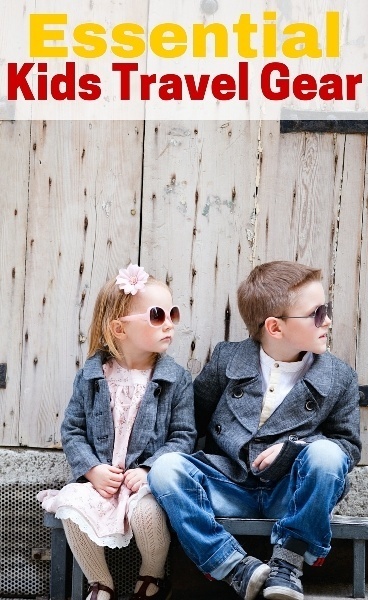 Love your blog so far, can I ask if you recommend particular products such as sunglasses for kids. My husband comes from Jakarta and where going in May. Our little girl will be 9months so from experience what could you recommend? Hi Louisa! I have just bought the only option I’ve usually been able to find in baby shops. I recommend one that does up (we have one with a velcro band) to make it a bit harder for your daughter to pull off. And my looking forward to going to la (USA) hopefully to see my sister in the not to distant furtive. I’m sure it is already on your blog as to where and what to see with kids. It sure is Louisa! We were just in LA in January. You can read about it here.